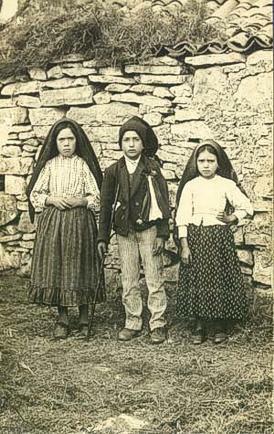 The Children of Fatima, Lucia Dos Santos, and her cousins,Jacinta and Francisco Marto, witnessed apparitions with a ‘Lady from Heaven’, later revealed as the Virgin Mary, on the 13th day of each month between May and October 1917 in Fatima, Portugal. The First Secret of Fatima was a Vision of Hell. The Second Secret of Fatima was the first of two prophesies depicting catastrophic future world events, delivered with a peace plan from Heaven. The Third Secret of Fatima was the second of two prophesies delivered in a harrowing vision. 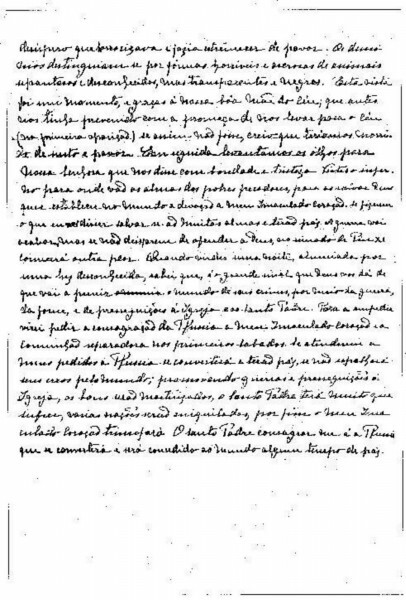 Both the First and Second Secret of Fatima were revealed in a letter written by the oldest Seer, Lucia, under the directive of the Bishop of Leiria, in August 1941. The Third Secret of Fatima was documented by Lucia in 1944, but not revealed to the public until the year 2000, by Pope John Paul II. The Vatican’s delay in publicly revealing the Third Secret of Fatima has caused controversy within the Church as marginal groups of devotees vie for authority over the meaning and message of Fatima. After showing the Children the First Secret of Fatima that was a Vision of Hell, the Virgin Mary promised the end of the War that was then raging through Europe. World War I commenced in 28 July 1914 and lasted until 11 November 1918. The Virgin Mary then prophesized a second, worse war if “people did not stop offending God”. This war, she predicted, would break out during the reign of Pope Pius XI (6th February 1922 – 10th February 1939). Hitler began his aggressive quest for Lebensraum, or more living space, in 1938, which initiated the threat of war by Britain and France. The Second World War was declared in September 1939 with the German invasion of Poland. The Virgin Mary promised that God would give a sign that “he is about to punish the world for its crimes, by means of war, famine and persecutions of the Church and the Holy Father”. This sign would be an unknown light illuminating the night sky. On January 25th 1938, a remarkable display of the Aurora Borealis was visible across Europe. It appeared as far south as Galicia in Spain where Sister Lucia recognized it as the sign from God, and which was recorded as visible to Pius XI in Rome. This unknown light was actually reported in The New York Times the following day as “Aurora Borealis startles Europe; People Flee in Fear; Call Firemen”. The Second Secret of Fatima delivered on July 13th 1917, included a peace plan from Heaven, a means by which the prophecy of war, and the spread of Communism from Russia, could be prevented. The Consecration of Russia to the Immaculate Heart of Mary. The Virgin Mary made clear that God wishes to establish world devotion to her. The Communion of Reparation on the First Saturdays. The Virgin Mary said that if her instructions in the Peace Plan were met, then Russia would be converted and there would be a period of peace in the world. Interpretation: The meaning of the conversion has been defined by the Church as the conversion of the Russian people to Roman Catholicism. Another interpretation of the meaning of ‘conversion’ is from the dominant ideology of Communism. The Virgin Mary goes on to say that if the Peace Plan conditions are not sufficiently met, that Russia would ‘spread her errors throughout the world, causing wars and persecutions of the Church. The good will be martyred; the Holy Father will have much to suffer; various nations will be annihilated’. After numerous failed attempts by consecutive Popes to consecrate the world to Our Lady of Fatima according to the instructions defined by the Virgin Mary, Pope John Paul II’s second attempt in 1984 was confirmed by Lucia, the oldest Seer, as being accepted by Heaven. FACT: Mikhail Gorbachev was elected as General Secretary of the Soviet Community Party in 1985, and served as the country’s head of state until 1991 when the USSR (Socialist Soviet Union) was dissolved. His reform policies of Perestroika (restructuring) and Glasnost would eventually lead to the dissolution of Socialist Soviet Union and the collapse of Communism as a ideological stronghold in Eastern Europe. 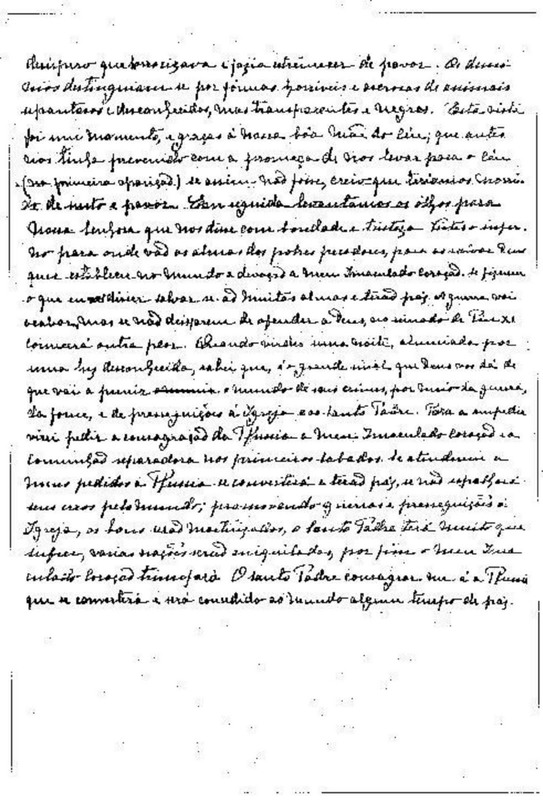 Image of the original letter written by Lucia Dos Santos in 1941, revealing the Second Secret of Fatima. Translation of the original text of the Second Secret of Fatima, as written by Lucia Dos Santos in the 1941 letter to the Bishop of Leiria…………..
“You have seen hell where the souls of poor sinners go. To save them, God wishes to establish in the world devotion to my Immaculate Heart. If what I say to you is done, many souls will be saved and there will be peace. The war is going to end: but if people do not cease offending God, a worse one will break out during the Pontificate of Pius XI. When you see a night illumined by an unknown light, know that this is the great sign given you by God that he is about to punish the world for its crimes, by means of war, famine, and persecutions of the Church and of the Holy Father. To prevent this, I shall come to ask for the consecration of Russia to my Immaculate Heart, and the Communion of reparation on the First Saturdays. If my requests are heeded, Russia will be converted, and there will be peace; if not, she will spread her errors throughout the world, causing wars and persecutions of the Church. The good will be martyred; the Holy Father will have much to suffer; various nations will be annihilated. In the end, my Immaculate Heart will triumph. The Holy Father will consecrate Russia to me, and she shall be converted, and a period of peace will be granted to the world”. What do YOU believe was the meaning of the Second Secret of Fatima? Do you think the prophecy has come true? Leave a comment, like or share..